Like a lot of people - I have a busy life. 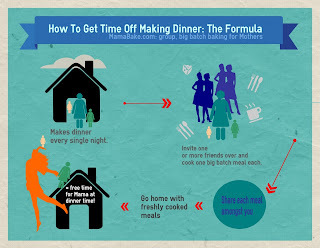 One of the things I struggle most with is getting a decent, relative healthy meal on the table every night. I work part time, my husband full time, my kids lead very active after school lives and where we live requires a ferry ride home every night. All of this adds to up to a lot of nights where you walk in the house later than normal, tired and really not inspired to do anything much. A couple of years ago, a friend introduced me to the concept of Mamabake. 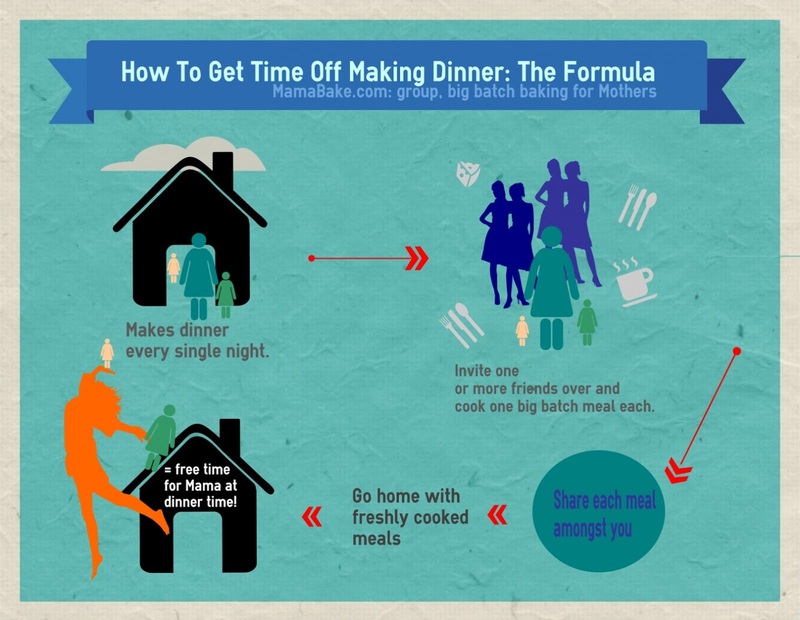 The image below, from the Mamabake website, describes how it works. We do it slightly differently. Rather than all cooking at one house, we make our meals separately and then come together to divide them up. Divvy up afternoon will usually involve a few drinks, cheese and a lovely social gathering. So our next Mamabake meet up is next weekend, so today I spent making Bobotie. According to Wikipedia, Bobotie is a South African dish. If you Google it, you will get a ton of different recipes. However, I came across the one I used while listening to ABC radio's Kelly Higgins Devine one day. She was talking to Suzanne Quintner one day who shared the recipe. I thought it sounded good, gave it a try and immediately decided it was perfect for Mamabake. If you click here, you will come to the original link for the recipe. Or, I've copied it for you below. Despite the seeming large number of ingredients, it's really easy and most people would have the ingredients in their pantry anyway. Four of these will make 6 x four person serves. I made 5 today - one for each Mamabake participant (including myself) plus one for dinner tonight. I usually had one in the oven, one simmering on the stove and one prepped and ready to go. All in all, it most probably took me 4 hours, with the last one waiting on the stove until I'm ready to put it in the oven for dinner. I do highly recommend having group A and group B mixed in the bowl ready to go and the bread soaking. ﻿﻿﻿﻿Use a heavy-based saucepan and let it get very warm. Add the ingredients of Group A and stirfry. CAREFUL NOT TO BURN! Add 4 tbsps butter mixed with the oil, and when warm, add onions. Simmer for 10 minutes. Remove from heat and add Group B. Add meat and bread (press out all the milk from the bread first and keep separate). Simmer covered for 20 minutes, stirring occasionally to make sure the bread and meat is cooked through. Pour into a greased baking dish. Beat milk with the eggs and turmeric and pour over the mixture. 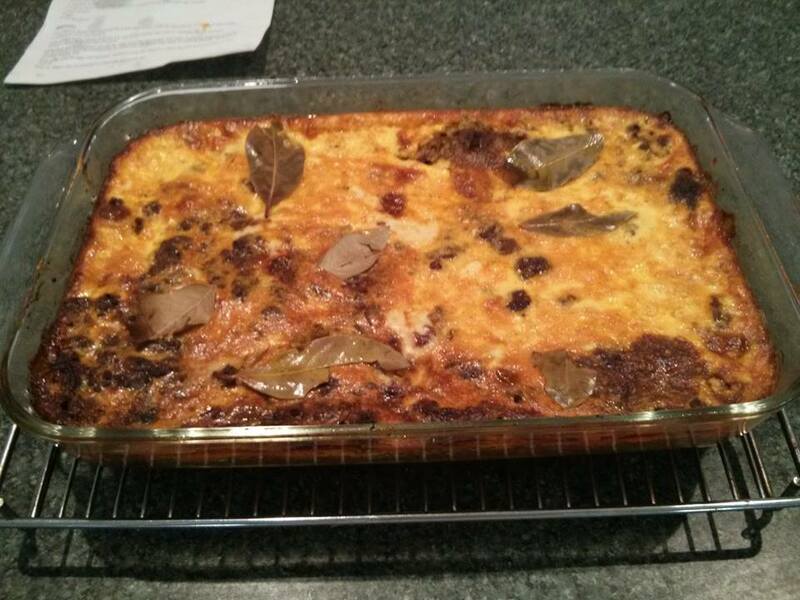 Place the bay leaves evenly in the custard. Bake at 180o C for 45 minutes or until egg custard is set.